(Kitco News) - Although the U.S. dollar has seen substantial inflows amid global uncertainty, one famed investor said the U.S. currency should not be where people seek refuge. 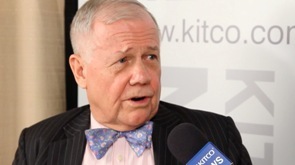 “I own U.S. dollars because there’s going to be more turmoil in the financial markets – currency and otherwise – in the next couple of years,” said Jim Rogers, chairman of Rogers Holdings and author of Street Smarts, in an interview on Palisade Radio on Wednesday. “And when there’s turmoil, many people flee to the U.S. dollars. They don’t know what else to do. They think it’s a safe haven; this is not a safe haven,” he added. According to Rogers, the fact that the U.S. is the largest debtor nation in history is a reason why investors shouldn’t lookto the country’s currency as a flight to safety. Based on data released by the U.S. Treasury, the total U.S. Federal government public debt outstanding is roughly at $18 trillion as of February 11. Looking at gold prices, in particular, Rogers said that although he expects to see its correction to continue, he anticipates buying opportunities to present themselves for investors in the metal. “I expect another opportunity to buy gold in the next year or two. And if so, I hope I’m smart enough to buy it,” he said. Rogers said that he even purchased a small amount of gold mining exchange-traded funds (ETFs) due to its correlation to the price of gold and because they have lost significant value already. “They can go up even if gold goes down just because they got beaten up so much. But I am not a big buyer; I just put a small, small, small toe in the water,” he said. On the topic of gold and the dollar’s current positive correlation, Rogers said he isn’t too concerned since he’s seen it come up in the past. “There’d been many times in history…unfortunately, people in the market just look at the last year or two. And this has happened at a time that gold has gone separate ways from U.S. dollars. It happens at times where it goes the same way,” he said. “I don’t pay too much attention to that particular movement at the moment," he said, stating that he will certainly be looking to accumulate gold and the U.S. dollars again.